The UF Libraries are holding our 4th Annual Spring Book Drive. Were you thinking of giving your office/lab a good spring cleaning before summer started? If you have books you no longer use, you could achieve several good things by donating them to the book drive. Collection boxes will be in all the main branches (Library West, Smathers/Library East, Marston Science, Health Science, Education, Architecture and Fine Arts, and the Legal Information Center) in the lobbies or near the information desk. The collection runs from April 20th thru May 1st, 2015. You can drop off your donation at any time during normal operating hours. Books that are not selected for the Libraries’ collections will either be sold or donated to other organizations. If you have any questions, please contact lib-GreenTeam@ad.ufl.edu. Are you looking for summer job on campus? Are you interested in helping fellow gators with their career needs? The CRC Career Ambassador position is for you! Career Ambassadors are undergraduate students hired to represent the Career Resource Center and its mission to facilitate holistic career development of students. As Career Ambassadors, student employees are responsible for providing specialized support, customer service and outreach to the University of Florida community. Career Ambassadors staff our Career Library, Front Desk and provide one-on-one help for students in Express Drop-In (in-depth training will be provided). We are looking for dependable students with strong communication skills, desire to help others and commitment to learning! Position is available immediately and throughout the Summer C semester. Federal Work Study is highly desirable. If you are interested in the position, please email Allie Ricker at AlexandraR@crc.ufl.edu for more information and application instructions. The Veterans Entrepreneurship Program (VEP) provides a rigorous entrepreneurial learning and development opportunity for service disabled veterans and those who have uniquely distinguished themselves in the military. The 8 day Boot Camp is intensive, rigorous, and demanding and we need YOU to help us make it a success! We are seeking undergraduate and graduate volunteers who can help us with a variety of shifts between Saturday, May 9th and Saturday, May 16th. Shifts will include opportunities to network with veterans and faculty. If you are interested in being part of the team that makes it all happen, please sign up for the time that works best with your schedule: http://bit.ly/1BMazHt. If you have any questions about the event or volunteering please email Hannah Morris at Hannah.Morris@warrington.ufl.edu. Partnership for Strong Families will be hosting our annual Partner Family Banquet for our current foster (or as we call them, partner) families at the Santa Fe River Ranch. Our foster parents are invited to bring their children (both biological and foster) out for a night of fun for the kids and dinner and entertainment for the parents. To show our parents our appreciation for everything they do for us and our community’s children in out-of-home care, we will be offering childcare offsite at the Hal Brady Recreation Complex (located at 14300 NW 146th Terrace, Alachua FL 32615) for children 4-11 years old. We are looking for volunteers to come out to the Recreation Complex from 5:30-8:30 p.m. to help us supervise the children. In addition to providing them dinner, we will have three bounce houses, carnival games, and crafts to keep the children busy. Currently we are expecting to have approximately 90 children in attendance and would love to have at least 15 volunteers help us out. If you are interested, please contact Recruitment Specialist Morgan Clement at (386) 249-1831. The Junior League of Gainesville – Read With Me Committee, is in need of teachers, student teachers, and intern volunteers to assist at a 3-day Reading Camp this summer. They are working with the Alachua County Library to offer this free-of-charge camp to elementary school children in the Gainesville area. The goal is to also include parents so that they are given better tools for reading with their children at home. The camp is tentatively scheduled for June 9-11 from 9am-12pm at the Milhopper Branch Library. If you are interested in participating or for more info, please contact Heather Sarkis at heather.sarkis@gmail.com or call 352-215-1980. Interested students (soon to be grads) seeking immediate employment, go to www.polk-fl.net to complete the online application and send an electronic resume (along with your PCPS online application reference ID#) to Annissa Brockington Wilfalk, annissa.wilfalk@polk-fl.net, for follow up. If you would prefer serving in a Pilot Sub capacity with the Polk County school district to gain some additional hands-on experience and exposure in our schools, this option is available too. Let Sustainable UF help you ‘green’ your spring cleaning at the annual Collection Day event. This initative provides an easy, fast and convenient way for students, faculty, staff, and UFHealth employees to donate household items for use in the community, and provides a safe way to get rid of hazardous and electronic waste for proper recycling or disposal. Please bring your items to the O’Connell Center Parking lot. Click here for a complete list of items and additional details. Elementary & Special Ed Students who will begin their FULL-TIME INTERNSHIP in Spring 2016. The Internship Orientation is Thursday, April 23 in Norman Room 250 at 9:30am. Faculty and students are invited to attend the 10th Annual SAGE Symposium, showcasing research conducted by the College of Education’s distinguished graduate students. Come and engage in conversation about critical areas of research in education and support your colleagues in their professional development as researchers. Are you feeling stressed during these last weeks of the semester? There are only two line dance classes left (4/28, 5/5)! Come join us from 5:30-6:30pm and learn dances to a variety of music such as Uptown Funk, Lady GaGa, Colt Ford, Taylor Swift, and Big & Rich to name a few! We will meet in 1327A and move to the Terrace Room if we have a large group. No experience required and all are welcome. You don’t need to wear cowboy boots, but you are welcome to wear them if you choose. Dress comfortably, wear shoes you can move in, and be sure to bring water. There is no set charge; however, I request a suggested $5 donation per class to help raise money for a mission trip to Uganda this summer to build a home for abandoned babies and work with children in an orphanage. Contact Jacqueline Swank with any questions, jswank@coe.ufl.edu. Oak Ridge High School located in Orlando, Florida is hiring for the following positions. For questions or further information, please contact Assistant Principal Mike Martucci at michael.martucci@ocps.net or (407) 852-3200 ext. 6102236. The School District of Lee County located in Fort Myers, Florida will be hosting our teacher recruitment fair on May 14th. For the required steps to register or other questions, visit careers.leeschools.net. CROP has positions available for individuals qualified to serve as camp counselors. the residency camp will run from Sunday, July 5th through Friday, July 10th and is designed to provide 9th and 10th graders with a “college experience.” Primary duties of counselors include 24/7 sight and sound supervision of camp participants. Compensation is $500 plus meals. The CROP Summer Residency Counselor application can be found at: https://education.ufl.edu/crop/crop-documents/. The deadline for applications is April 17th at 5pm. Will receive full training, background checks and district badging at no cost. Can teach up to 20 sessions per week. Will earn $20 per session as an independent contractor team member. Can actively pursue employment opportunities with SCB46 schools and clients. For more information about this opportunity, have students visit http://www.sourcecodeb46.com/university-program. Please forward additional questions to Sarah Stack at sarah@sourcecodeb46.com. Learn more about opportunities in HCPS through Teach in Tampa and apply today. The Early Application Deadline is Friday, April 17th. Candidates who apply early will have the best chance of securing early contracts for the 2015-2016 school year. The salary for teachers with zero years of experience is $38,000 plus board-paid benefits. The Teach in Tampa website has much more information about why outstanding new teachers graduating from University of Florida should consider joining Team HCPS—including our reputation for innovation, our shared commitment to excellence, and the countless opportunities we have for teachers to take a leading role in their schools and within the district. Lakewood Ranch High School is a fairly new school having been open for 16 years. We are a big 7A school approximately 2300 students located in East Manatee County. We have been designated as an “A” school by the Florida Department of Education for most of the years we have been open. We have built one of the most dominate high school sports programs in the state being in the top of both of the FHSAA major awards consecutively for the last 5 years. We also excel in our fine and performing arts programs winning many awards. The community of Lakewood Ranch is one of the fastest growing communities in the US. We are looking for highly motivated teachers that would like to come in and help build on the success that has been started. Please email resume to Shawn Trent, trents@manateeschools.net, or call 941-727-6100 for questions. Teachers Needed for Next School Year! Ruth Rains Middle School in Cross City, Florida is looking for 2 English/Language Arts Teachers, 1 Math Teacher, 1 Science Teacher and possible 1 Reading Teacher for next school year. Please send your resume to the Principal, Alexa Mills, at alexamills@dixie.k12.fl.us. Now Hiring! Summer Job Opportunity! Looking to make money and make a difference? If so, the City of Gainesville’s Parks, Recreation and Cultural Affairs Department has an opportunity that you might qualify for! www.cityofgainesville.jobs Contact LaRose Manker with any questions at 352-393-8709. We are looking for a responsible babysitter who can drive and has access to a vehicle to help with our two children ages 12 and 4. Hours would primarily be in the evenings between 3-6pm on weekdays. Competitive hourly pay offered. We live in the southwest part of Gainesville. If interested, please contact Uma at 352-219-2272 (cell) or 352-331-9938. Gainesville family with four children ages 5 years old, 4 years old, 3 years old and 3 years old seeking babysitter on Sunday afternoons, one weekday evening per week, and a few weekdays during the summer. Responsibilities include playing with children, taking walks to nearby playground, making child meals, and helping children as they learn to clean up. No driving. Our children are, of course, wonderfully fun, loving and cheerful. References will be requested. If interested please email Chris at c@ufl.edu. EduGators! FEA elections are here! Please take time to vote for your next executive board at http://www.surveymonkey.com/s/S9T7939​ Votes are due by Friday evening, feel free to vote on your own time, or vote at our meeting tonight at 8pm in the Norman Terrace Room! ECC will be selling new Edugator shirts in the SRC this week! The proof can be found on the ECC website and Facebook page, Education College Council at UF. Shirts are $12 and can be paid by cash or check made out to the University of Florida! The Harn Museum of Art and the UF Science for Life Program, in collaboration with the Office of Research, and the Colleges of Agricultural & Life Sciences, Health & Human Performance, and Liberal Arts & Sciences are hosting the first MASH Museum Night. In addition to the exhibits and performances by mathematics and science faculty, staff, and students MASH will include a food buffet, hands-on activities for children, and fun mathematics/art/science trivia competitions. All are welcome to attend. The event is from 6-9 p.m.
**If you would like to participate by exhibiting your art or other creative work such as photography, drawings, paintings, digital media, or performances of dance, music or theater, the deadline for applications is Friday, April 10th. Go here to submit an online application:http://sfl.aa.ufl.edu/index.php?link=mash. Contact Christy LaPlante at christyn@ufl.edu or David Julian at djulian@ufl.edu if you have any questions. Gators For All Abilities is an upcoming UF student organization. The goal of the organization is to empower students with disabilities and allies by promoting disability advocacy, fostering a supportive and inclusive community, and providing leadership development experiences. We are looking for passionate UF students, either undergraduate or graduate, to apply for the positions we have open. Our Treasurer position as well as our positions for Committee Chairs and Committee Co-Chairs are available for you to apply for! More in depth position descriptions and expectations are listed at the top of our application link. Monday, April 20, 4 p.m. in the Judaica Suite, located on the 2nd floor of Smathers Library (East), Dr. Schwebel will discuss her most current project, a digital archive of materials related to Scott O’Dell’s Newbery award-winning children’s book Island of the Blue Dolphins, and how it relates to nature, historical narratives, and colonialism. The archive will be released in 2016 alongside the first-ever critical edition of Island of the Blue Dolphins. Sara Schwebel holds a Ph.D. from Harvard University and is an Associate Professor of English at the University of South Carolina. She teaches children’s, young adult, and American literature. She is the author of Child-Sized History: Fictions of the Past in U.S. Classrooms and a number of academic articles about children’s historical fiction and history pedagogy. This event is co-sponsored by the Baldwin Library of Historical Children’s Literature (George A. Smathers Libraries), the Center for Children’s Literature and Culture, and the Department of English as part of the Baldwin Library’s Annual Speaker Series. Want to enjoy a full meal while you witness the fruition of ASTRA’s fundraising efforts toward this year’s philanthropy project? Learn how to get more involved in the local Gainesville community with us at ASTRA’s last general body meeting of the semester on Monday, April 20th at 6 PM in Stuzin 104. Elections for next year’s executive board will be held, scholarship winners will be announced, and club T-shirts will be available for purchase. If attending, please RSVP to pr.astrauf@gmail.com. Have you always wanted to learn to line dance? Now’s the time to start! Join me from 5:30-6:30pm on Tuesdays in the Terrace Room starting Tuesday, March 31. We will meet every Tuesday through the end of April, except for Tuesday the 14th because the Terrace Room is not available that day…unless we can find an alternative location. If you can’t make it every week, that is okay too; come when you can. No experience required and all are welcome. You don’t need to wear cowboy boots, but you are welcome to wear them if you choose. We will learn line dances to a variety of music. Dress comfortably, wear shoes you can move in, and be sure to bring water. There is no set charge; however, I request a suggested $5 donation per class to help raise money for a mission trip to Uganda this summer to build a home for abandoned babies and work with children in an orphanage. Line dancing is lots of fun and a great stress reliever for the end of the academic year. Please contact Jacqueline Swank with any questions, jswank@coe.ufl.edu. If you will be completing your degree requirements in Summer A 2015, applications for award of the degree are being accepted through ISIS under the My Record menu> degree application from the ISIS left menu. The application deadline is May 13th by 5:00pm. Education minors can stop by the Office of Student Services to complete a graduation check before completing their degree applications. Let us make sure you are set to go! Graduation checks can also be completed by sending a request to studenthelp@coe.ufl.edu. If you will be completing your degree requirements in Summer B/C 2015, applications for award of the degree are being accepted through ISIS under the My Record menu> degree application from the ISIS left menu. The application deadline is July 1st by 5:00pm. Education minors can stop by the Office of Student Services to complete a graduation check before completing their degree applications. Let us make sure you are set to go! Graduation checks can also be completed by sending a request to studenthelp@coe.ufl.edu. I need a tutor to teach English for my son, a 2nd grade Korean boy. $15/hour for payment. I want to get tutoring twice per a week. Located in Magnolia Place Apartments. Please contact janghyera77@gmail.com or 352-872-8274. Teaching isn’t the only profession you’ll hear about if you attend UF’s College of Education Career Night on Wednesday, April 8th. From 4-5 pm, in the Reitz Union Auditorium, there will be a panel of four dynamic College of Education alumni offering career advice and discussing the distinctly different career paths they each have followed—quite successfully—after earning their education degrees at UF. This panel is open to everyone! Following the Career Panel, join us in the Reitz Union Ballroom from 5-7:00 pm to network with recruiters in education at the “Careers in Education” Career Fair. All majors are encouraged and invited to attend! Volunteers & Science Exhibitors are needed from 8am-3pm at the Santa Fe College Track. Encourage future scientists and engineers in this solar model car and solar cooker demonstration. Volunteers are needed to organize and host the expo which will feature local middle- and high school students in the Junior Solar Spring and Solar Cook-Off on the Santa Fe College track. To volunteer, visit https://sites.google.com/site/northfloridaenergywhizexpo/. To learn more, contact Adrienne Thieke at adriennethieke@gmail.com; Dr. Marin Smilov at marin.smillov@sfcollege.edu or 213-1414; or Dr. Sindia Rivera-Jiminez at sindia.rivera-jiminez@sfcollege.edu. Contact Christy LaPlante at christyn@ufl.edu or David Julian at djulian@ufl.edu if you have any questions. 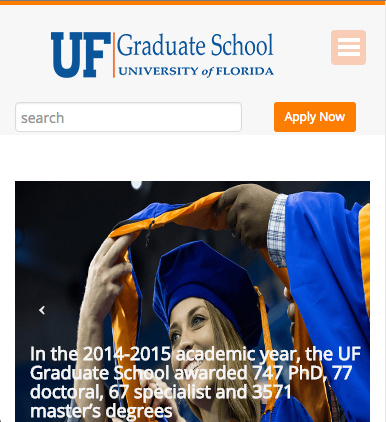 If you will be completing your degree requirements in Summer A 2015, applications for award of the degree are being accepted through one.uf.edu under the My Record menu> degree application from the one.uf.edu left menu. The application deadline is May 13th by 5:00pm. Education minors can stop by the Office of Student Services to complete a graduation check before completing their degree applications. Let us make sure you are set to go! Graduation checks can also be completed by sending a request to studenthelp@coe.ufl.edu. 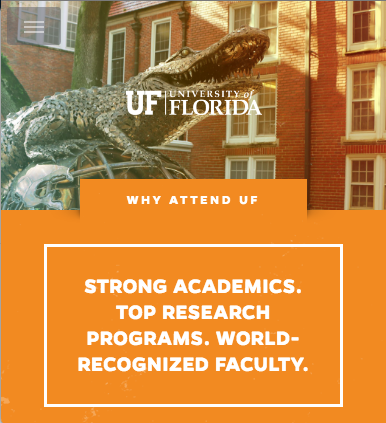 If you will be completing your degree requirements in Summer B/C 2015, applications for award of the degree are being accepted through one.uf.edu under the My Record menu> degree application from the one.uf.edu left menu. The application deadline is July 1st by 5:00pm. Education minors can stop by the Office of Student Services to complete a graduation check before completing their degree applications. Let us make sure you are set to go! 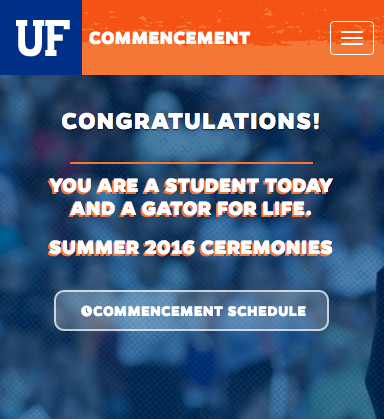 Graduation checks can also be completed by sending a request to studenthelp@coe.ufl.edu. Stressed? Worried about a friend? Kognito can help! With the stress of the semester piling up and deadlines looming at every turn, the UF Counseling and Wellness Center would like to highlight Kognito, an online resource to help students learn to recognize signs of stress and realistically practice talking to other students about it, with the goal of connecting them with support on campus. 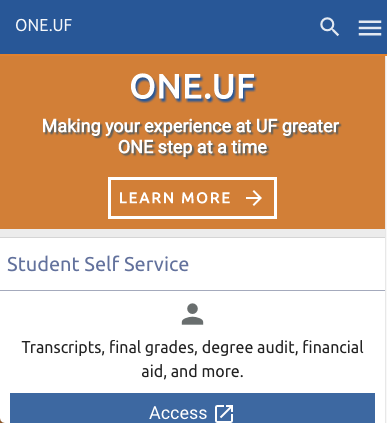 UF students are able to do this for FREE through the Counseling and Wellness Center’s home page at www.counseling.ufl.edu where you can click on the “Worried about a Friend” link, or at http://counseling.ufl.edu/cwc/kognito-for-students?mID=186. This experience is done at each person’s convenience, and only takes 30 minutes. This gives YOU the chance to develop an invaluable set of skills to help friends in distress and, quite possibly, to help prevent suicide. If you need help setting up an account or have any questions please contact the student Kognito Coordinator, Ashley Jacobs at ashleynjacobs@ufl.edu. Thanks for doing your part in supporting the wellness of our fellow Gators! Talking Walls has been at University of Florida for over 15 years and recently relocated to a more convenient location with store front parking. We are offering graduating students $70.00 off Diploma frames with 10% of all sales going back to UF as we’re licensed by the Collegiate Licensing Company. CROP has positions available for individuals qualified to serve as camp counselors. the residency camp will run from Sunday, July 5th through Friday, July 10th and is designed to provide 9th and 10th graders with a “college experience.” Primary duties of counselors include 24/7 sight and sound supervision of camp participants. Compensation is $500 plus meals. The CROP Summer Residency Counselor application can be found at:https://education.ufl.edu/crop/crop-documents/. The deadline for applications is April 17th at 5pm. St. Pius, a historically African American school located on the North side of Jacksonville, will have positions open for the next school year; 1st & 2nd grades, potentially more. If you are interested, please send your resume to the Principal, Sister Cynthia Shaffers, principal@stpiusjax.com. Explore http://www.stpiusjax.com to learn more about all of the wonderful things happening at St. Pius. Learn more about opportunities in HCPS through Teach in Tampa and apply today. They will be attending the Careers in Education Career Fair on April 8th and setting up interviews for qualified applicants with the HCPS Principals. The Early Application Deadline is Friday, April 17th. Candidates who apply early will have the best chance of securing early contracts for the 2015-2016 school year. The salary for teachers with zero years of experience is $38,000 plus board-paid benefits. The Teach in Tampa website has much more information about why outstanding new teachers graduating from University of Florida should consider joining Team HCPS—including our reputation for innovation, our shared commitment to excellence, and the countless opportunities we have for teachers to take a leading role in their schools and within the district. Lakewood Ranch High School will be attending the Careers in Education Career Fair on Wednesday, April 8th. This is a fairly new school having been open for 16 years. We are a big 7A school approximately 2300 students located in East Manatee County. We have been designated as an “A” school by the Florida Department of Education for most of the years we have been open. We have built one of the most dominate high school sports programs in the state being in the top of both of the FHSAA major awards consecutively for the last 5 years. We also excel in our fine and performing arts programs winning many awards. The community of Lakewood Ranch is one of the fastest growing communities in the US. We are looking for highly motivated teachers that would like to come in and help build on the success that has been started. Please email resume to Shawn Trent, trents@manateeschools.net, or call 941-727-6100 for questions. Balance 180 Gymnastics & Sports Academy is a local non-profit organization that focuses on integrating children with varying abilities through sports. This summer, we are running our third annual summer camp, and need volunteers that are excited to work with children with special needs! Summer camp is a great learning experience for student volunteers. All of our volunteers work 1-1 or 2-1 with the participating campers in a wide range of activities including gymnastics, crafts, and games. The athletes have a range of disabilities including Autism, Down Syndrome, ADD/ADHD, and Cerebral Palsy among others. Camp will be offered July 13 – July 31, Monday – Friday, from 8am-5pm. Volunteers do not need to commit to the entire three weeks or all day, however, we do ask that volunteers sign up in advance for the days they are available and indicate either morning (8am-12:30pm) or afternoon (12:30pm-5pm) shifts. We are so excited to be offering an inclusive camp again this summer for children in the Gainesville community! 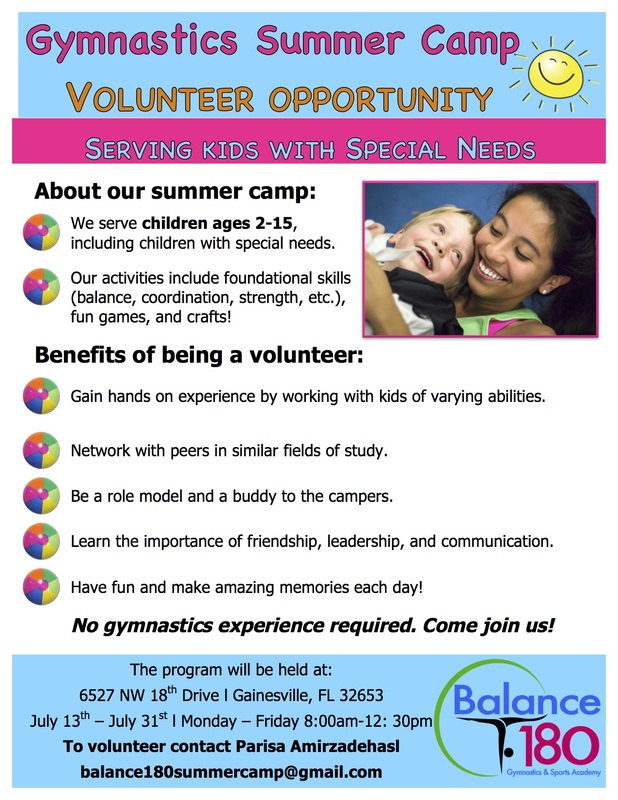 If you are interested in volunteering, please email balance180summercamp@gmail.com. Applications are being accepted until April 18th. Professional family seeking education student with nanny experience and interest in working with one fun-loving 3 year old boy. Approximately 30 hours a week (12–6pm daily M-F with some flexibility for right individual). Responsibilities would include pick up from pre-school, make child’s meals, take child to classes and playground, and other light household responsibilities (i.e. fold laundry, tidy kitchen, etc). Must have safe car and safe driving record. Must have references. Please call or email Brian at 617-750-2264 or bmawds@yahoo.com. Need tutor for 8-yr old son in second grade. Preferably someone who can go after school twice a week, after school and/or Saturday to O2B Kids Super Center on Newberry Road for at least 1/2 hour increments. He is currently working above grade level but recently since this new curriculum he has been having a bit of a struggle with the reading comprehension portion. Please contact Pamela Brown at (352) 494-9679. The SEC/ACC Virtual Career Fair is April 1st & 2nd! Currently we have a list of 130+ excellent employers registered for the event. (Review Employer List Here). This is a great way to immerse yourself in more opportunities that could benefit your future. REGISTER HERE! The UF Teaching Center is offering this workshop on April 1st & 2nd from 5-7 p.m. to help students prepare for the GRE exam. Students are welcome to register for both sessions. The workshop is free. To register and learn the room locations, go to the Teaching Center website, click on Study Skills and then Workshops. Looking for a diverse service club that offers a whole range of volunteer opportunities? You’ll be sure to find what you need with ASTRA! Join us at our next general body meeting on Monday, April 6th at 6:00 PM in Stuzin 104. We will have a speaker from Gators March for Babies to talk about our philanthropy project for the upcoming academic year. In addition to this, we have available for you many other events to come. Free pizza will be served and we will have a team-building activity. All are welcome! Please RSVP at https://www.facebook.com/events/412809332225246/ or email pr.astrauf@gmail.com. This event is jointly sponsored by the College of Liberal Arts and Sciences Teaching Center and the Office of Faculty Development and Teaching Excellence. For questions, contact Jennifer Smith at jksmith@ufl.edu. Peace Corps will be hosting an Information Session on Tuesday, April 7th from 1:00- 2:30pm in the International Center in the HUB. Come meet your Campus Peace Corps Recruiter, learn about Peace Corps requirements and benefits, and find out what opportunities there are to serve specifically in the Education sector. Contact Bobbi Stienmetz peacecorps@ufic.ufl.edu for more information. Teaching isn’t the only profession you’ll hear about if you attend UF’s College of Education Career Night on Wednesday, April 8th. From 4-5 pm, in the Reitz Union Auditorium, there will be a panel of four dynamic College of Education alumni offering career advice and discussing the distinctly different career paths they each have followed—quite successfully—after earning their education degrees at UF. This panel is open to everyone! Following the Career Panel, join us in the Reitz Union Ballroom from 5-7:30 pm to network with recruiters in education at the “Careers in Education” Career Fair. All majors are encouraged and invited to attend! Peaceful Paths is currently seeking 3 qualified individuals to fill part-time positions in the Child & Youth Programs. Specific information about each position can be found at www.peacefulpaths.org/jobs. Applicants should apply using the job application found at the bottom of each job posting. Any questions about these openings can be directed to John Thomas, Director of Child & Youth Programs by email at johnt@peacefulpaths.org.